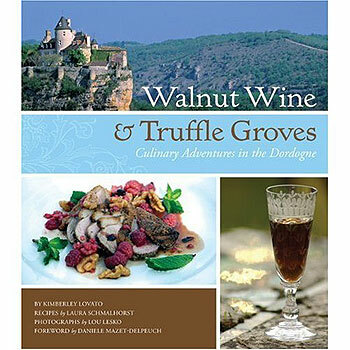 Walnut Wine and Truffle Groves is a culinary travel book that invites readers to pull up a chair and visit the Dordogne one bite at a time. Kimberley Lovato and Chef Laura Schmalhorst navigate the back roads, as well as the menus and markets, with newfound excitement and a fork and knife! Through interviews with local home cooks and chefs, visits to local farms and historic sites, market and winery tours, readers will discover the jewels in France’s culinary crown and visit the country’s most beautiful and less trod-upon provinces. The book includes more than 40 recipes and photos by Lou Lesko bring this historic and gourmet region of France to life in a book that will have you booking your next voyage to the Dordogne, or at least enjoying the journey from your own kitchen table. This excerpt recounts Lovato's meeting with Roland Manouvrier. When I first saw Roland Manouvrier he was wearing a lab coat and a large plastic cap set askew over his thick mop of dark hair. Looking very much the part of mad scientist, he greeted me with a handshake and a cone full of neon orange mandarin sorbet. It couldn’t have tasted and smelled better if I had plucked it from a tree. I licked, and nodded, and licked some more, as I looked around his kitchen, half expecting to find a bubbling cauldron and a potion book, but all I saw was spotless stainless steel. “I like the idea of people responding to a specific flavor in an emotional or sensual way,” said Manouvrier at my reaction to the taste. It is precisely this emotional voyage that has this glacier (ice cream maker) from the tiny town of St. Geniès, in the Dordogne region of southwestern France, conjuring up new and unorthodox flavors, called parfums in French. 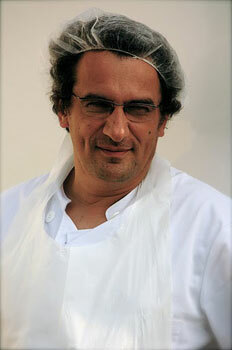 Szechwan pepper, foie gras, tomato-basil and calvados are just a few of his far out fabrications. I dug into some of them right there, my plastic spoon mining generic white tubs with black handwriting identifying each taste, including a rose ice cream the exact pale pink of the flowers I had at my wedding. I told him the taste reminded me of the smell of my grandmother’s garden. I was certainly a believer. It only took a wisp of the rose-scented cream, and a drop of it on my tongue, to be transported instantaneously to my childhood. I wondered why Manouvrier didn’t have shops all over the world, or at least all over this culinary corner of the country. He prefers to remain undiscovered. “Sought out” was how he put it, and he sells only to restaurants that dare to serve something different in a part of France where traditional cooking is as linked to the region's patrimony as the local Occitan dialect. 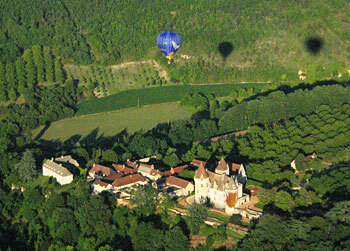 Most good news (and bad) around the Dordogne travels as they say, de bouche à oreille, from mouth to ear. I found market stalls, inn owners and butcher shops were the best sources of information on where to find the plumpest raspberries; which local wines had a good year; who doesn’t use fresh herbs in their soup (quelle horreur); and even how to cook a leg of lamb. It’s the human Internet, no signal needed. Manouvrier came onto my radar in the same way, into my ear from the mouth of Nicolas DeVisch, a creative young chef at a restaurant in the medieval market town of Issigeac. “Do you want to taste something incredible?” he asked, after an already incredible meal. DeVisch disappeared and returned with a white tub coated with ice crystals. He handed my friends and me a spoon, and we each scooped out a ball of white velvet. Around the table, one by one, we looked at one another and raised our eyebrows. It was not the coconut, vanilla or other traditional sweet sensation we expected, but something surprising and pleasing -- goat cheese. I knew I had to meet the creator. The book features more than 80 photographs by Lou Lesko. Standing in his kitchen while handing me another spoonful of something decadent, Manouvrier sniffed around me like a bloodhound and identified the brand of the perfume I was wearing. He then asked me if I had ever read Patrick Süskind’s novel Perfume in which the main character creates the ultimate scent (made from beautiful women) to achieve certain reactions. I told him I had not. Manouvrier said he draws his inspiration from the perfume makers of Paris in the Middle Ages who could incite reactions to specific scents. “I thought, why not adapt this concept to ice cream,” he said. A reaction is exactly what he got as I shoveled in more spoonfuls of goodness. Even more remarkable than my raised eyebrows and time travel to my grandmother’s garden was the skillfulness at which these creamy creations reached beyond my taste buds. The melding of color, smell and texture carefully integrated into each parfum was nothing short of alchemy. “I believe people should experience food, not just taste it,” he said. And that I did. Before coming to St. Geniès, I took for granted the power of my senses. 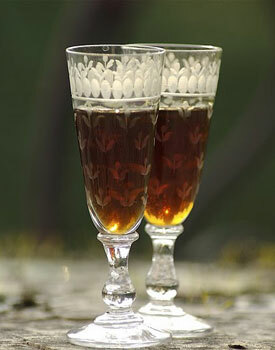 But after passing an afternoon in Manouvrier’s kitchen, it would be impossible to do so now. I asked him for a recipe but he said he doesn’t write them down. More raised eyebrows from me. 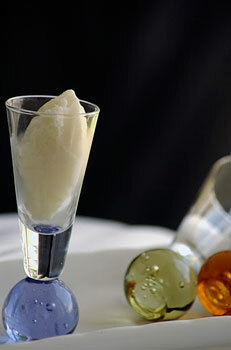 “To find the right balance between taste and texture is not exact. It is a reaction that depends on many influences,” he explained. I guess I can’t expect the magician to reveal all his secrets. Kimberley Lovato is a freelance writer who just recently left Brussels, Belgium to try San Francisco for a while. She is a perpetual student of all things French, though she is not averse to any other language or culture, especially if there is food involved. Visit her website, kimberleylovato.com. Chef Laura Schmalhorst ran a custom events venue in Florida for 25 years. In 2003, she founded Vagabond Gourmet, a luxury culinary tour company that leads adventurous foodies around the world. She lives in Tampa, Florida. Visit her website Chefsontheloose.